Tall pink tureen reflecting Wedgwood design with web style patterning and a lid. Rapid Manufacture from a plaster and gypsum material with a unique non-fired ceramic coating. Designed on Rhino and Freeform software. Manufactured on a ZCorp 450 3D printing machine from ZCorp 131 powder (plaster/gypsum/polymer composite), then infiltrated with proprietary infiltrant (to add strength) and coated in a non-fired ceramic material (alumino/silicate/calcic). In an email to Crafts Council staff on 30/09/2005, Eden writes: 'The ceramic material that has been used to coat both pieces is exactly the same base material, though the Wedgwoodn't material was stained with pigments to resemble black basalt. It is an aluminia/silica/calcic ceramic material, and is as durable as coventional ceramics. A Tall Pink Round Wedgwoodn't Tureen, Michael Eden, 2010, Crafts Council Collection: P493. Photo: Todd-White Art Photography. Interview with Michael Eden, P493, CraftCubes 2010. The Wedgwoodn't Tureen came about as part of my MPhil research project at the Royal College of Art. 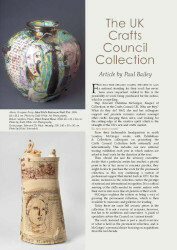 I used the opportunity to investigate the relationship between the traditional craft skills that I had developed over 20 years as a maker of slip decorated earthenware and the new digital tools that I had become interested in. I wanted to explore how and whether the tacit knowledge and sensibility to the three-dimensional form could be transferred. I discovered that digital tools can be used in many of the same ways but require the refinement of existing craft skills or the development of new ones. It is definitely not the case that the maker just has 'to press a button'. The conclusion that I came to is that the maker has more choice of tools in the toolbox and it is up to them to choose the most appropriate materials, tools and processes to realise their ideas. Sources of Inspiration…….. 3D printing or Additive Layer Manufacturing potentially allows for almost anything to be made, but I want to take advantage of that creative freedom to make objects that cannot be made by any other means. For the Wedgwoodn't Tureen I took an iconic object from the first Industrial Revolution and redesigned it in a way in which it could not be manufactured using conventional methods. I chose Wedgwood because of the role Josiah Wedgwood played in the advancing the craft and industry of ceramics. Subsequent work has also been used to explore the potential of the technology, but in a way that has a narrative content. So some pieces explore the relationship between 'actual and virtual' ways of making objects, other pieces engage the viewer with ideas about the perceived value of crafted objects.